To really succeed with your fat loss goal, it’s important to keep your meals light, lean and filled with protein. 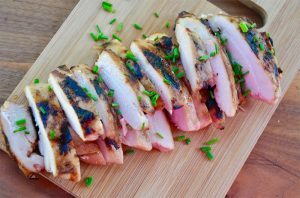 Try this recipe for marinating and grilling chicken. Make lots and pack for a week of healthy lunches paired with veggies or dark leafy greens. 2. Combine the sake, coconut aminos, swerve, olive oil, garlic and ginger in a large ziplock bag. Generously salt and pepper the chicken thighs and add to the bag of marinade. Seal the bag and place in the fridge for 1 to 4 hours, turning once. 3. Grill until the chicken thighs are cooked through. Enjoy! One serving equals 493 calories, 10g fat, 9g carbohydrate, 3g fiber, and 56g protein.